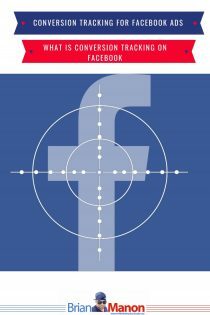 Conversion tracking is an online marketing technique that allows advertisers to measure the return on investment of Facebook Ads. This is done by using the conversion tracking pixel that Facebook provides. (example of conversion tracking – number of Sales, leads, number of visitors to a page. The use of conversion tracking is recommended for all sites who sell a product whether it is physical or digital, as it allows you to know your return on investment and optimize campaigns based on results. 4. 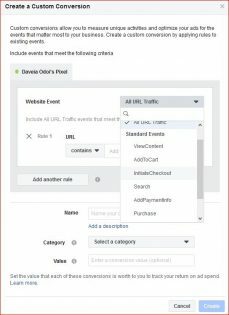 Choose a Website Event from the drop-down menu and create a rule for that event. To create another event as part of this custom conversion, click Add another rule. 5. Add a name so that you can identify it later in your reports. You can also add a optional description. 7. Choose a conversion value. This can be the price of a item if they are purchasing a product or you can just add 1 if it is a lead. That is it. You have created your first Facebook custom conversion tracking. All you have to do now is create a conversion ad then choose the conversion you just created. If you have any questions concerning Custom Conversions or Facebook ads please check out some of my other Facebook ads articles or leave a comment below.